Home / Electrical Articles / What is generation of electrical energy? 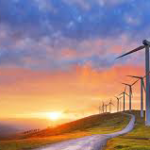 The conversion of energy available in different forms in different form in nature into electrical energy is known as generation of electrical energy. Energy is available in various form different natural sources such as pressure head of water, chemical energy of fuels, nuclear energy of radioactive substance etc. All these forms of energy can be converted into electrical energy by the use of suitable arrangement. 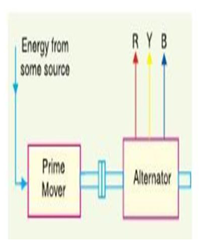 The prime mover is driven by the energy obtained from various sources such as burning of fuel, pressure of water, force of wind etc. The steam is fed to prime mover which may be a steam engine or a steam turbine. 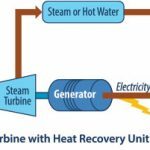 The turbine converts heat energy of steam into mechanical energy which is further converted into electrical energy by the alternation. Similarly, other forms of energy can be converted into electrical energy.